Long Islanders could hear some thunder overnight. Pockets of heavy rain accompanied by thunderstorms are forecast to track across Long Island during the Monday morning commute. Suburbs west of New York City are expected to bear the brunt of torrential rain which is forecast to hit Nassau County in a weakened state between 2 a.m. and 3 a.m. and wrap up on the East End by 8 a.m., according to the National Weather Service. The rainy and foggy conditions could result in visibility of just a quarter-mile for motorists. 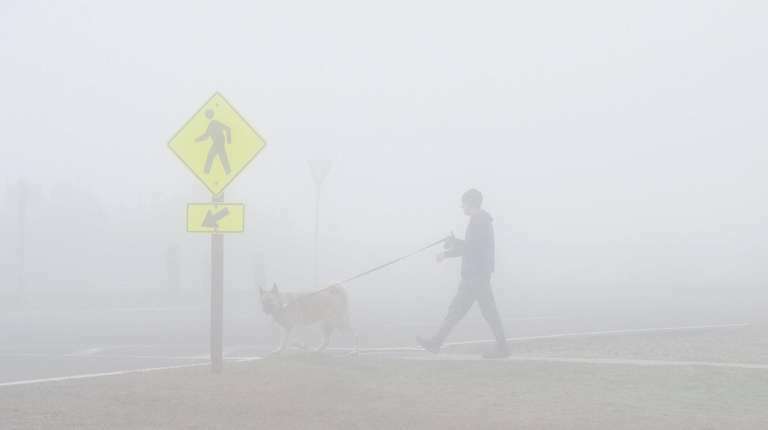 There is a dense fog advisory until 6 a.m. Monday, the weather service said. "Folks on Long Island could hear some rumbles of thunder," said Tim Morrin, a meteorologist at the National Weather Service in Upton. "We are not anticipating severe weather for Long Island. By the time it gets to Long Island it will be in a weakened form. But there could be some pockets of heavy rain and some ponding on the roadways but nothing major expected." The weather system first appeared Sunday afternoon on Long Island with drizzle, light rain and fog. Precipitation chances on Monday are 80 percent and rain totals are estimated at between a half-inch and an inch, according to the weather service. Monday's high temperature is expected to hit 63 degrees, while lows will be around 40. Daytime wind gusts could be as high as 36 mph. Monday's rainy conditions shouldn't surprise anyone familiar wtih the old adage: April showers bring May flowers. "It's very common for spring," said Morrin. Tuesday will be sunny with a high of near 60 degrees followed by Wednesday will be in the upper 50s, except for the East End which may be in the lower 50s. Thursday’s forecast calls for a high in the mid- to upper-50s and Friday’s calls for temperatures in the lower 60s or upper 50s.